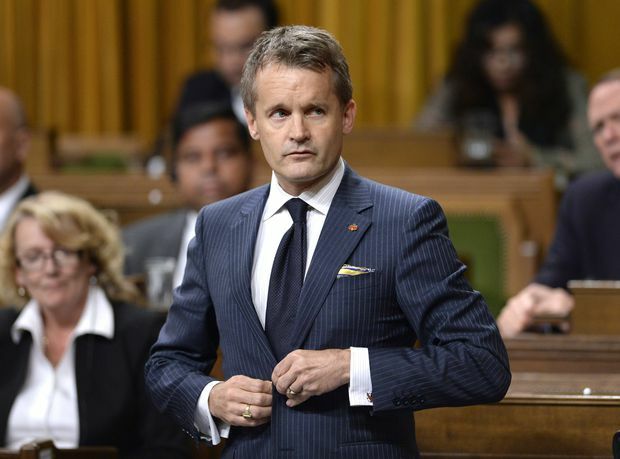 Veterans Affairs Minister Seamus O’Regan has taken on one of his most persistent critics, fighting the Gulf War vet in print and in court over the new lifetime pensions that the Liberal government will introduce for retired military personnel with permanent injuries. Mr. O’Regan went on the offensive after Sean Bruyea, one of Canada’s best-known veterans' advocates, disparaged the federal government’s new Pensions for Life program in an Ottawa newspaper in February. Mr. Bruyea argued that the new pensions, which apply to veterans who retired in 2006 or later, will fall short of what is given to veterans, such as him, who retired before 2006 and fall under the old Pension Act. Mr. Bruyea says is angry that Mr. O’Regan suggested he got his facts wrong when the department said the numbers were mostly correct, and says the remaining matters of disagreement simply reflect different points of view. He took the matter to Small Claims Court in May claiming $25,000 for the damages he said the minister’s rebuttal did to his reputation. But government lawyers convinced a judge to throw out the case on the basis of Ontario’s Protection of Public Participation Act, an anti-SLAPP (strategic lawsuit against public participation) law created to discourage the use of litigation to stifle debate in the public interest. Anti-SLAPP laws are meant to safeguard individuals with limited resources from far more powerful parties with deep pockets from mounting lawsuits designed to silence their critics. However, Mr. O’Regan seemingly used this law to argue that a lone man threatened the freedom of speech of the federal government. Mr. Bruyea, a 54-year-old former military intelligence officer who was left permanently disabled with PTSD as a result of his service in the Gulf War, plans to appeal. He is angry that Mr. O’Regan suggested he got his facts wrong when the department said the numbers were mostly correct, and says the remaining matters of disagreement simply reflect different points of view. He takes particular offence at the minister’s suggestion he was acting to further his own agenda because, as an older veteran who falls under the former Pension Act, he already has a lifetime pension. His said his criticisms of the Pensions for Life program, which will take effect in March of next year, are aimed at improving the lot of newer veterans who don’t get the same level of benefits that he does. When asked why his response to Mr. Bruyea was so personal, Mr. O’Regan said in a telephone interview on Sunday that he has spent the past year trying to explain the Pensions for Life at town halls across the country to veterans who are “stressed out” by the fact that changes are coming. Minister of Veterans Affairs Seamus O'Regan rises during Question Period in the House of Commons on Parliament Hill in Ottawa on Sept. 24, 2018. Mr. O’Regan and department officials insist that no veterans will lose money under the new Pensions for Life, and most will receive more. In the column that he used to rebut Mr. Bruyea, the minister said it is clear the Pensions for Life will leave disabled veterans better off. The minister said he had no say in the decision to use the anti-SLAPP law to defeat Mr. Bruyea’s lawsuit; that was up to Justice Department officials. The minister’s staff said in telephone discussions last week with The Globe and Mail that it is difficult, if not impossible, to determine whether the Pension Act veterans will be paid more or less, in general, than the veterans who will receive the Pensions for Life because so many different scenarios and calculations come into play. Documents obtained by Mr. Bruyea under the federal access-to-information law show that, after his column appeared in print, Mr. O’Regan’s staff asked VAC department officials to scour it for errors. The responses from the bureaucrats, which are also contained in the access documents, show that, while they found some mistakes in his piece (some calculations were off by a percentage point or two and he incorrectly deduced that some female vets would get less per month than their male counterparts), they agreed Mr. Bruyea’s assertions were mostly factual. When Mr. Bruyea’s defamation suit went to Small Claims Court, two Justice Department lawyers and an intern showed up to represent Mr. O’Regan. In appealing that ruling, Mr. Bruyea has enlisted the services of prominent human-rights lawyer Paul Champ. Editor’s note: The Pensions for Life for disabled veterans will apply to veterans who left the service in 2006 or later. The old Pension Act applies to veterans who left the service before 2006. Incorrect information appeared Thursday in a story about a dispute between Veterans Affairs Minister Seamus O’Regan and veterans advocate Sean Bruyea.